NEW YORK (CNS) – True to form, exotic settings, stale dictums and always-murky moral values characterize “Furious 7” (Universal), the latest installment in the “Fast and Furious” series. 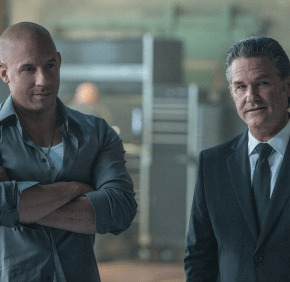 In this go-round, cross-necklaced Dom Toretto (Vin Diesel), still the putatively Catholic paterfamilias, sets out to avenge the death of his old friend, Han (Sung Kang), killed off in a previous episode. He also reunites with his amnesia-stricken longtime love, Letty (Michelle Rodriguez) — whose memory is gradually returning — as well as his rough-and-ready colleagues Brian (Paul Walker), Tej (Chris “Ludacris” Bridges), Mia (Jordana Brewster), and Roman (Tyrese Gibson). Musclebound federal agent Luke Hobbs (Dwayne Johnson), by contrast, doesn’t rejoin the proceedings until the final showdown. Director James Wan and screenwriter Chris Morgan dispense with the subplots explaining how the crew of underground car racers was reassembled. Instead, they provide scenes of the happy family lives some — Brian, especially — must leave behind to fight the forces of evil. By that, he means there’s far less road driving. Instead, the speedsters’ cars drop out of planes and fly off cliffs. One even crashes through the windows of an Abu Dhabi skyscraper. The laws of physics, as per usual, are ignored in order to display breathtaking special effects — accompanied, of course, by fistfights and shootouts. Dom and gang are aided by amiable, mysterious Mr. Nobody (Kurt Russell). He wants to get his hands on a cutting-edge tracking program called God’s Eye, which allows its owner to access every surveillance camera on the planet. To operate it, he’ll need the help of Ramsey (Nathalie Emmanuel), a glamorous hacker who is also the only person around who knows how to make the software work. The plot is bogged down by a lengthy, elegiac ending designed to be a tribute to Walker, who died during filming. Naturally, though, fans of the star — or of the franchise — won’t mind a bit. The film contains a vengeance theme, nearly nonstop gun and physical violence, a few uses of profanity and fleeting crude and crass language. The Catholic News Service classification is A-III — adults. The Motion Picture Association of America rating is PG-13 — parents strongly cautioned. Some material may be inappropriate for children under 13. “Furious 7” (Universal) — Catholic News Service classification, A-III — adults. Motion Picture Association of America rating, PG-13 — parents strongly cautioned. Some material may be inappropriate for children under 13.